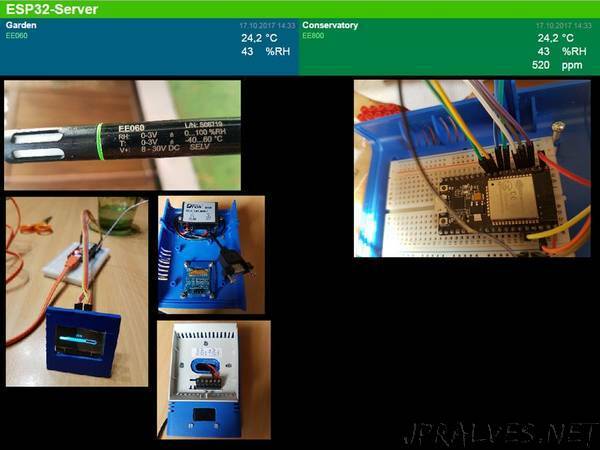 “Use ESP32 with an industrial grade sensor as BLE server. This is part ONE from a series of projects connected together. The goal is to monitor my environment at home. For this series I cover 3 areas where I use different technologies for each single element. Let’s start with the conservatory (winter garden) and the garden next to it. Approach one - get environmental data from the garden. For this I use a sensor which is able to capture humidity (0-100%) and temperature (-40 to 60 °C). The sensor I use is an EE060 with analog output. I choose this sensor because it is precise and robust, providing industrial grade operations even in harsh environments. In my case it delivers 0-3V (different ranges are available). Although 0-10V is more common 0-3V is a good choice because the ESP32 analog inputs work for a range of 0-3.3V.